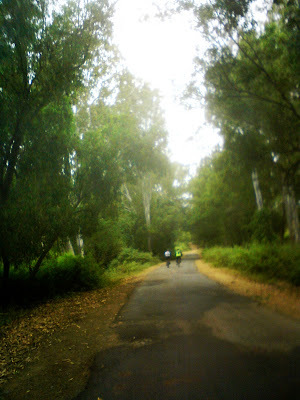 The first brevet of the season and the debut brevet of the IISc randonneurs turned out to be quite a challenging ride. The beautiful roads and picturesque scenery almost made up for a combined assault of rain, wind, climbs and unpaved sections. We started off at 6. A bit late actually, maybe 6.15. I was riding with Bharathkumar and Dheeraj, and we quickly made our way to Magadi road. The Pipeline road climbs had been removed from the route due to one section being closed for construction, so it did not take too long. There was a light drizzle since morning and I had thought it would let up, but by now I was pretty much soaked. In retrospect I should have put on my raincoat at the start itself. We had a target of reaching the Magadi control by 8.10 (corresponding to an average of 20kmh) since most of Magadi road is downhill. Bharat was speeding up and Dheeraj and I could not keep up. We saw him at Bacchenahalli , just after the climb, having idlis, after that we never caught up with him. Dheeraj and I decided to stick to our plan of going on till magadi and grabbing breakfast there. This was mistake number two, since the magadi control had no thindi (breakfast, snacks) places nearby and we had to hunt through magadi town for breakfast, wasting precious time. Moreover the roads in magadi were all mud and slush after all the rain, so my bike was pretty messed up. The route from Magadi to Huliyurdurga was perhaps the most beautiful. It had stopped raining a little while before but i was still cold and wet. There was no sunshine to speak of and the sky remained an angry gray with intermittent drizzle. I had ridden this route only once before but I remembered the route, so the cue sheet was safely packed away. At Huliyirdurga we got the cue sheets out and started out for Koppa. We almost missed the left turn to the dirt road, but for a lady working in an adjacent field who told us that all the other cyclists went the other way. This next section was unpaved mud road. I could still manage about 25 kmh at times, and at times I had to wait for Dheeraj who was playing it safe with his hybrid. The front sus and wide tires made life pretty comfy for me at this point, and we finished the 13km to Koppa without incident. There are sugarcane farms all along the road, and there are a number of trucks, tractors and bullock carts hauling sugarcane to the mill at Koppa. By the time we crossed Koppa it was becoming hot and the headwinds were pretty strong. I began to slow down and was struggling to keep up with Dheeraj despite regular swigs of glucose. At times I would lose sight of him for long stretches. On winding roads like this one it is impossible to spot a rider who may be just a few minutes ahead, and this is very bad for morale. I did not have a computer so I had pretty much no idea of how far I was, and without speed measurement i fear i was slowing down dangerously. I finally caught up with Dheeraj and we rode the remaining distance to Maddur at a reasonable speed, making it to the control with about 30 mins to spare. More time was wasted in finding the famous Maddur Tiffanys (of which there seem to be a dozen - we picked one that had a dozen bikes parked outside) and had a quick lunch of idli-vada. We started from Maddur at 1:40PM, the closing time for the control, which meant that we had lost all our 'spare time' and had to do the remaining ride at 15kmh average. We began at a decent pace only to run into immense headwinds that slowed us down to 12-15kmh. We took turns drafting behind one other and managed to make it to Ramanagara at just over the minimum required 15kmh. This worried me immensely because the control was after the massive manchanbele climb - and averaging 15kmh was going to be hard. Luckily the road was very quiet with no traffic, and a close watch on Dheeraj's computers helped us keep up 18-20kmph with minimal breaks till the climb, and we made it to the control with about 15 minutes to spare. The last leg was now the crucial part - 32km in 2 hours - and all uphill. Thankfully pipeline road was not part of the route. It felt like some gripping 50 overs cricket match where the chasing team is never in the clear till the winning run is scored, except we were doing the chasing. Magadi road is extremely boring to ride back, with hordes of insensitive motorists to keep you on the alert. Especially people who overtake you with much honking, only to take a left turn a few seconds later forcing you to brake. And private buses lit up like christmas trees who stop just anywhere. And indecisive pedestrians who cross like squirrels do. The stretch from Thavarkere to Sundarakatte seems almost twice as long as in the other direction, and is a non-stop climb till the fast Magadi descent. Ironically, there was a traffic jam on that descent wasting more time and energy (The LED signboard at this junction warned "Speed Kills" and "Expect delays"). We had done pretty good time so far and the odds were now in our favor. However, traffic slowed us down in Mahalaxmipuram, near ISKCON and at Yeswanthpur. We pushed our bikes on the pavement and reached the final control barely within the stipulated time. Great write up and CONGRATULATIONS on completing the 200KM Brevet! Your experience is an inspiration to wannabe randonneurs like yours truly.